I was recently forwarded the podcast in which Dr. Sam Harris and Dr. Jordan Peterson would engage in a debate regarding what appeared to be the meaning of truth… specifically as it pertains to religious beliefs. Harris is a neuroscientist by training and is seemingly known for his promotion of spirituality without any religious involvement. Peterson is a clinical psychologist by training and identifies himself as a Christian who is deeply religious. He criticizes atheists who he believes oversimplify the philosophy of Christianity based on their critiques. I’ve been waffling on putting a “Health Tip” piece together as it seems as though there are a plethora of health gurus at the public’s disposal. Please make note that I do not consider myself a “health guru” nor a guru of anything for that matter. I’m simply a person that has basic questions about systems… the human body, society, and everything else in between. When it comes to health or wellness, I believe that much like a house, the foundation must be of great strength to withstand stress. In my opinion, the three most important points in terms of building a rock solid foundation for health comprise of 3 keys: sleep, shitting, and respiratory patterns. 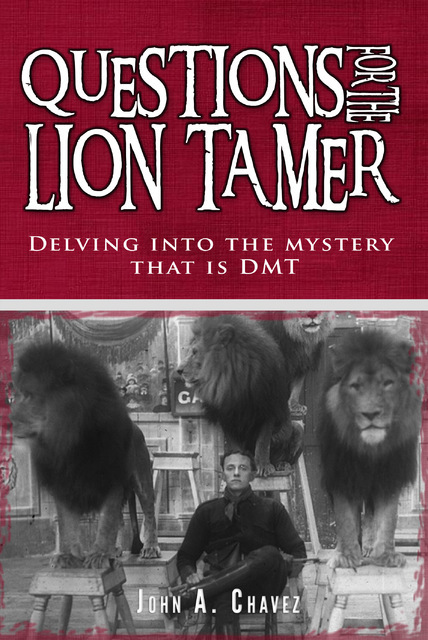 Questions for the Lion Tamer… Book Now Available! Since I’ve received dozens of requests for a hard copy version of the information found on this site, I’ve decided to compile them in a book format. The book spans 352 pages and costs $19.99. I’ve set this price as a “nature tax” being that all the content can be found here at Q4LT.com for free. Hopefully it will give your eyes a rest from reading extensively on an electronic device. I’ve tried to present the info on this site in a sequential format that makes sense in terms of tying in the synchronous changes in the electrical brain/body alongside hormonal/neurotransmitter fluctuations. While DMT has been the focal point of discussion at Q4LT, it seems that our entire endogenous “hallucinogenic” system is in play. Enjoy the hard copy and If you feel inspired, please leave me an honest review at Amazon! In conversing with dozens of people who practice a form of the meditative, breathing exercise known as the “Wim Hof Method” (WHM)… one particular ability has caught my attention. Many of these practitioners have developed the capacity to willfully influence the temperature of their body via what seems to be intent and/or visualization. A 2014 study in the Proceedings of the National Academy of Sciences observed the ability of Wim Hof and a group of practitioners as being capable of willfully influencing their autonomic nervous systems. Being that the autonomic nervous system is directly related to maintaining the body’s core internal temperature (thermoregulation), the ability of conscious temperature manipulation comes as no surprise. Transcendental Meditation, Kriya Yoga, the “Wim Hof Method”, sleep cycles, hypnosis, and a general study of the “Electric Body” have led me to devise what I call… the “DC Shift Reset”. There is no “magic” involved but rather a rather straight forward method of shifting cerebrospinal fluid (CSF) from the lower spine into the cranial cavity, increasing CSF production, and utilizing rhythmic respiration to alter one’s biochemistry. Obviously altered EEG states, neurotransmitter/hormonal release, and DC directional changes are also in order. Let us delve right into it. Ayahuasca is becoming increasing well known across the globe as people from all walks of life are being exposed to this shamanic brew. In 2016, The New Yorker, Business Insider, and The Guardian all published pieces regarding the boom in Ayahuasca ceremonies taking place throughout the world including unlikely locations such as New York and the San Francisco Bay Area. As many of you well know, the ingredients within Ayahuasca comprise of DMT and a monoamine oxidase inhibitor (MAOI). Generally speaking the ingredients utilized for Ayahuasca are comprised of Psychotria Viridis which provides the N,N-dimethyltryptamine (DMT) and Banisteriopsis Caapi (B. Caapi) which provides the MAOI properties. I utilize the term “generally speaking” being that different shamans utilize different combinations of plants with a slight variation of effects. In general, when the term “brainwashing” arises, we tend to think of a person who has joined some form of “cult” in which they have discarded their own beliefs for that of the organization. In it’s most extreme form, one might cite dramatic cases of group suicide as observed in the 1990’s with the Heaven’s Gate Cult, the 1970’s with Jim Jones, and the Branch Davidians religious sect in Waco, Texas. It would be presumed that in order to agree to commit suicide, one must willingly undergo severe levels of “brainwashing”. However, much like different levels of exogenous DMT administration (and anything for that matter) appear to generate distinctly different experiences, perhaps there are different levels of brainwashing? Melatonin… Circadian or EEG related? It is considered general consensus in the scientific community that the hormone/neurotransmitter melatonin is involved in the synchronization of a person’s circadian rhythm. These rhythms are based on physical, mental and behavioral changes that generally follow a 24-hour cycle with responses to light and darkness in the environment. Elevated melatonin levels have long been cited to concur with darkness while suppressed melatonin levels have been attributed to light exposure.